Talk Tuesday: Advanced Style Never Looked So Good. I’m going to take a quote from Confessions of a Shopaholic and change it a bit “When I dress up, the world gets better, and the world is better, but then it’s not, and I need to do it again.” Which fashion-minded person can’t relate to that? We use fashion to cope, to express ourselves, to show knowledge, power, wealth or not. All of those, plus more are things we when we’re young and it only evolves with age. One of my favorite videos, Advanced Style: Age and Beauty, on Nowness.com, features women who we have to admire for their sense of style during the senior years of live. 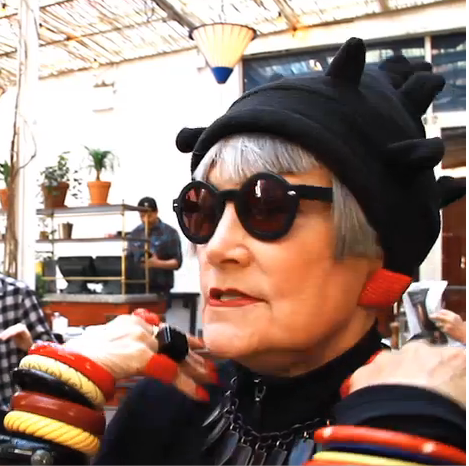 Iris Apfel and artist Ilona Royce Smithkin are some of the stars in the video and are also regulars on Ari Seth Cohen’s Advanced Style blog, who’s interview accompanied the video on the website. Here is bit of the of it from Nowness.com. ” Did anyone help to inspire the direction of Advanced Style? When I first moved to New York [from Seattle] I attended a screening for the documentary Hats Off about Mimi Weddell, who in her 60s became an actress and model for the likes of Louis Vuitton and Burberry. I photographed her, and her attitude and approach to style was a big influence on me and the start of the blog. Who would you most like the chance to photograph for Advanced Style?